In the South of Norway, the weather was incredibly good during the entire month of February. 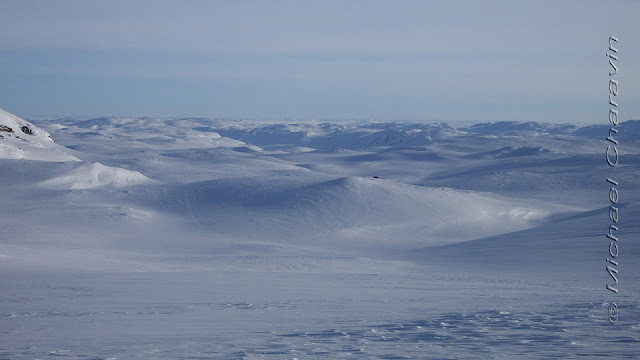 It was not without a certain fatalism that we take note of the weather reports announcing a change for the week to come... Normal, in a way, the good weather had lasted too long already... And indeed, at our arrival at Finse on Saturday, March 1st, a strong gale is raging. 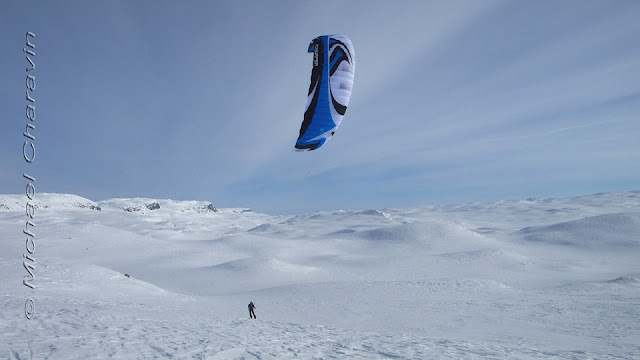 We have no other choice than to wait until the next day for things to calm down for our first kite session, made in Norway 2013. Cornelius, parawing 8 m² S, on the west part of the Finsevatnet lake. On Monday, 3 and Tuesday, 4, the wind eased out sufficiently, so that we could finally unpack our new toys. But the pale luminosity still masks a lot of the surface texture which we discover to be very sculptured by the wind, full of hard sastrugis. We do not remember having seen comparable snow conditions on the Finsevatnet lake since we know the area. 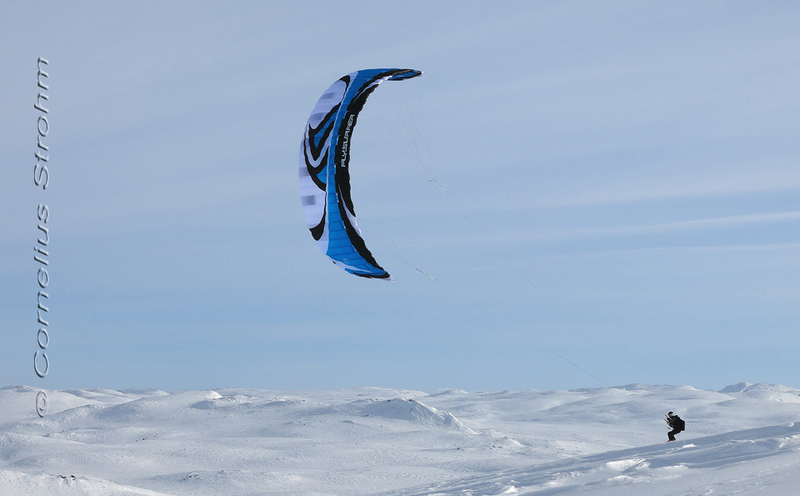 The first time we finally get hands on our Speed 4 10 m², we stay on the Finse lake and on some slopes dominating its surroundings, but we couldn’t really switch into high gear and take advantage of the full potential of this new generation of kites yet. Since then, a nice session at one of our alpine home spots in Cervières, French Alps allowed us to better appreciate this excellent wing. 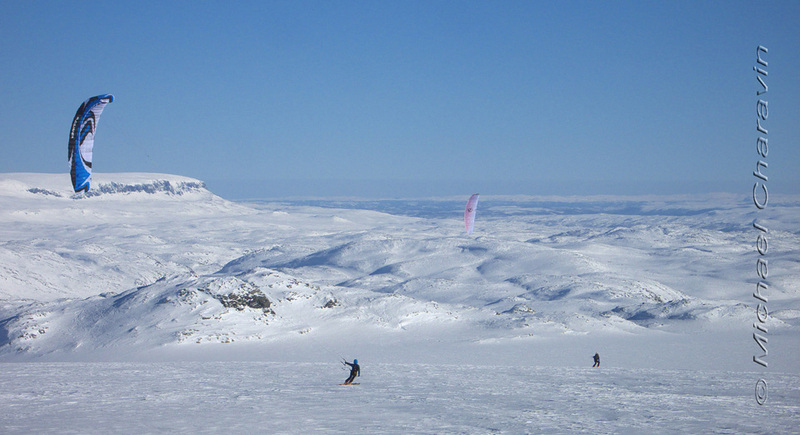 Mika swooping down the slopes of Bukkeskinnsbotn, foothills of Hardangerjökulen (above). 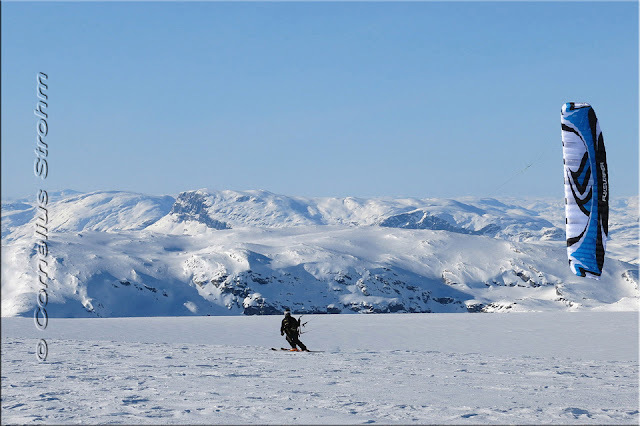 On the Finse lake (below), Speed 4 10 m² Deluxe. The next 3 days, the wind turned east and south-east which is synonym for more stable conditions, very beautiful days, intensely sunny, but also low winds. We took out the big ones, our Speed 3 19 m2 got unleashed, ready to reveal their full potential ! Wednesday, an erratic breeze on the lake eventually convinces us to put the skins on our skis in order to reach the heights of Hardangerjökulen, a small icecap peaking at 1863 m. Small, only on the scale applicable to nordic contries, but sixth biggest glacier of Norway with a surface of 73 km². Cornelius, more realistic, skins up almost to the top, to make sure to catch the wind. Mika thinks he can take advantage of the light breeze blowing on the Middalen glacier, in the hope to gain some height quickly and with less efforts... Wrong idea... ! 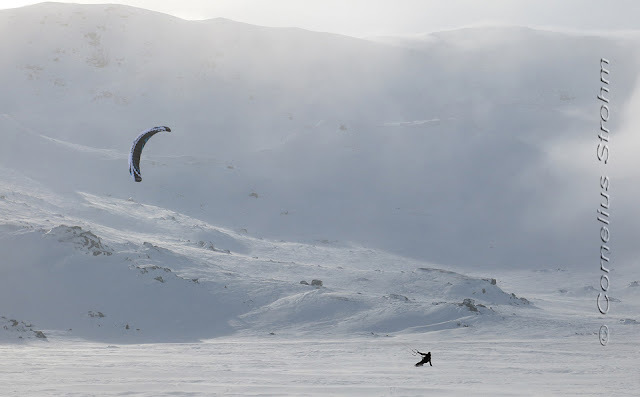 It is necessary to say that we had never experienced a phenomenon as strange as this one, the light catabatic creeping down the surface of the glacier was clearly sufficient to make a kite of 12 m2 or even 10 m2 fly. Yet the thickness of the catabatic layer barely exceeded 5 m in height. Above, the wing faints systematically. If the breeze was sufficient to barely keep the sail just above the ground level, it didn't allow the kite to raise. In every kite loop, the wing would loose power and drop again. Mika persists in this hopeless task in the expectation to find a stronger catabatic flow on the west side of the glacier. He eventually gets grounded for good. Ready to give up and return back home, he perceives the blue and white sail of Cornelius far on the summit crest of Hardangerjökulen, changes his mind, puts on the skins again, and climbs the Middalen glacier. It is already 16:30 when he finally reaches the summit crest, where the wind had sensibly picked up in the meanwhile. Cornelius, has already left off to kite down one of the small glaciers in the northeast. 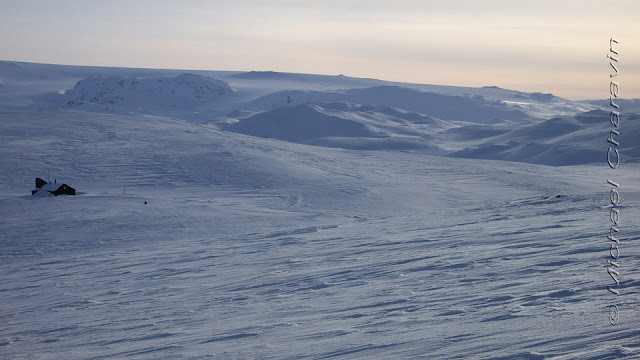 The top of the icecap is slightly undulated, the landscape very open, and the view ranges from the Hardanger plateau to the far south and east, as well as the mountains of Skarvheimen and even the Jötulheimen - peak of Scandinavia in the north. 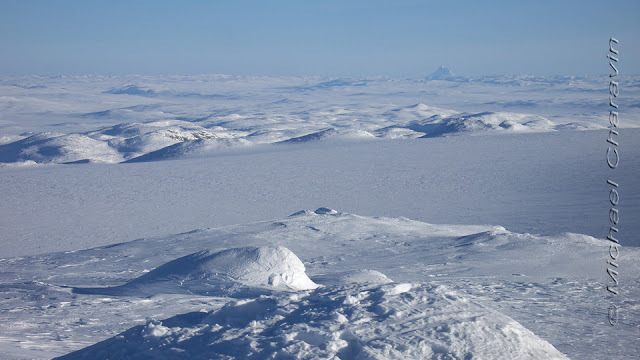 Unexpectedly, the surface of the icecap is much better than the hard packed and rough snow which covers almost all of the lower parts. Sunset on the summit of Hardangerjökulen and the Blaisen glacier. 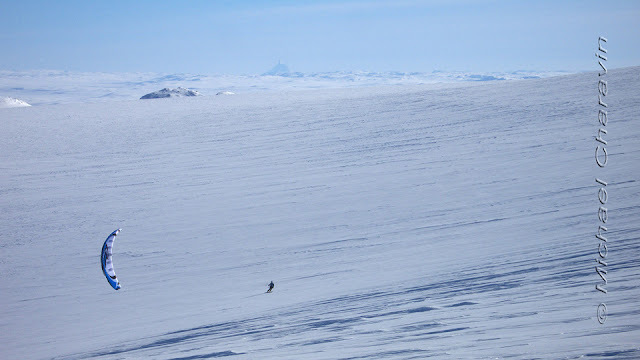 In the background, the seemingly endless plateaus of Hardangevidda. 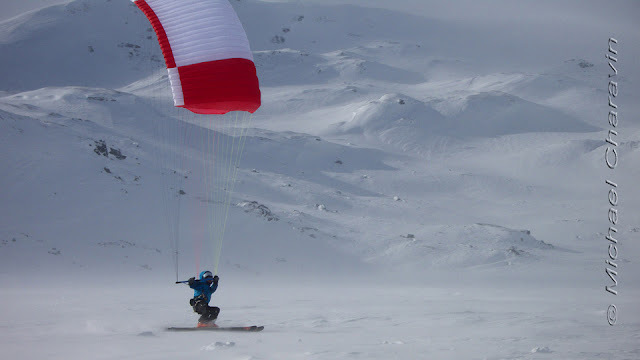 By now, the sun is already low on the horizon and after a few tacks, Mika pricks towards the northeast and kites down the Blaisen glacier, in headwind. Once on its terminal part, where the slope gets pretty steep, the kite suddenly moves by 120 degrees in the wind window, switching at once from head- to tailwind. A sign that the rider has just left the layer affected by the meteorologic wind and found again the catabatic. After negotiating the bit tough exit from Blaisen in tailwind, he finally loses the wind at the glacier front. 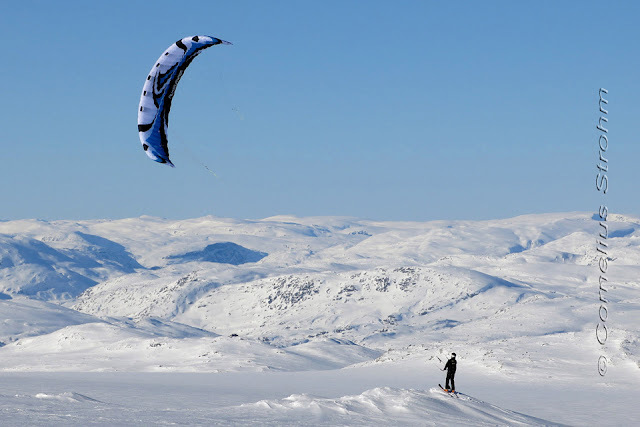 Michael packs the kite, and calculates his return route to make best use of the slope and finish the last kilometers skating at nightfall, full of good mood. On Thursday, March 7th,, with same weather forecast and always no wind on the lake, we put on the skins again. This time we climb the south slopes of the hills dominating Finse , in the direction of Satehjellane mountains. 200 vertical meters above the village, we find light easterly winds. We get out the big kites and play a moment on the heights of Sanddalsnuten, but as soon as we lose a little altitude, the breeze becomes erratic, sometimes non-existent. 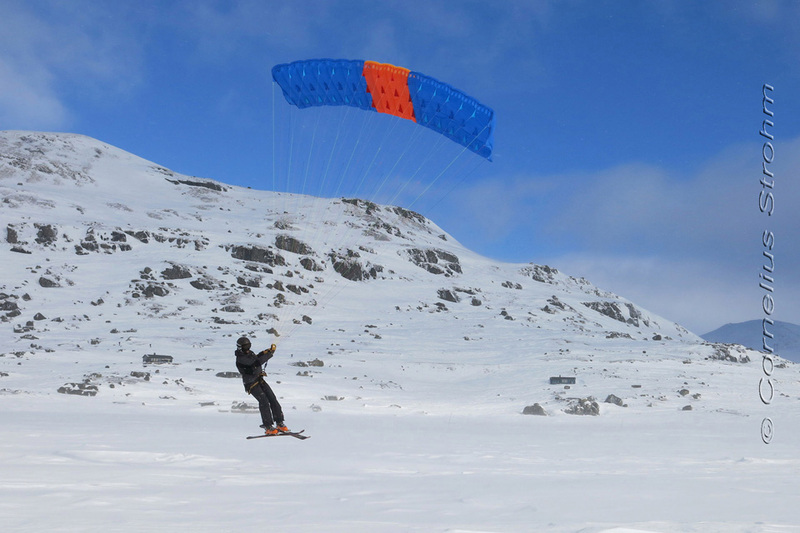 Cornelius " kiteloopes " to come back up the slopes of Sanddalsnuten, Speed 3 19 m² Deluxe. But finding the spot a little to small while the surrounding undulating landscape invites to roam, we follow the temptation and venture northward, unsure about the wind. We cross a first depression, a lake shielded from the wind, as fast as possible and notice to our great pleasure, that the little speed we gained in joining the bottom is enough to slightly power up the 19 and to get us cross the depression. Amazing! For one hour, we fight in an almost non-existent wind, trying to round our kiteloops well while staying as close as possible to the moraine ridges, diving from time to time into little slopes to get across some shallow valleys and small lakes. This way, we eventually reach the Klemsbu shelter, and the Sankt Pål peak. Klemsbu shelter in Satehjellane mounts. In the background, the Hardangerjökulen massif. 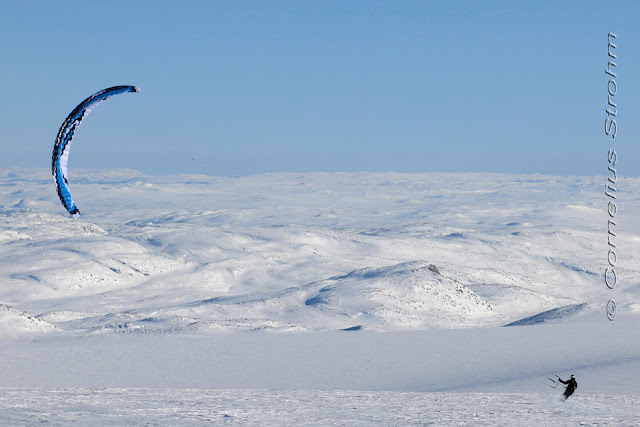 We are convinced, that in order to get back to Finse we would have to pack the kites, as the valley we are about to follow seems entirely shielded from the wind. While moving closer to the slope announcing the valley, we set ourselves an ultimate point to reach by kite and where we are convinced we would definitely lose the wind. But no ! The gentle breeze pouring down the slope together with our slightly downward trajectory gives sufficient power to our kites to continue. Throughout the entire day, the behavior of the Speed 3 19 m2 left us really amazed. It is obvious that we would not have been able to make this days tour with a smaller kite. With sometimes very little wind, we managed to make slow but efficient progress, doing long series of kiteloops on the more favorable side, much helped by the ingenious Infinity Bar, without ever completely losing the wind or "folding the ears". As long as the sail is moving, even at very low speed, the canopy remains inflated and extremely stable. At the end of the loops, when the kite rises up again, it is a precious advantage to be able to focus on the trajectory without having to care about the risk of deflation. On the other hand, we had to permanently pull on the back lines behind floaters in order to close our manys loops of small diameter. Interestingly, every time we were able to gain some speed, there was immediately a considerable increase in power, making any kiteloops unnecessary. On Friday, 8, the sun still shines, and there is almost no wind at Finse and on the lake. We are not sure where to go today. But looking through the windows of our cabin, an observation suddenly puts an end to our hesitation. 3 kiters are making their way up the Blaisen glacier headed to the Hardangerjökulen. Cornelius riding up Blaisen glacier, Hardangerjökulen massif. Today, the breeze is just sufficient to start right from the lake. We don't ask for more ! Once again, we realize that even in very low winds, the Speed 3 19 m2 already nows to unfold its full potential. It takes us only a few minutes and about ten tacks, where we needed at least twice more the previous years, to reach the eastern border of the Blaisen glacier. A feeling of outrageous efficiency ! This kite has surprising power reserves, we only need to pick up a minimum of speed to be able to power it up and lock it in in the wind window. By the way, the headwind tacks are distinct with really high windward angles. Cornelius under Speed 3 19 m² and Ronny Finsaas with its foil set on 50 meters lines. In the lower part of Blaisen, a catabatic cancels the meteorologic wind resulting in a zone of turbulences. Some loops allow to pass the last one of the 3 kiters spotted from our cabin one hour before, a group of pleasant Czechs, buried for some time in this area of complex aerology. But a little higher up on the curved glacier, the catabatic strengthens the meteorolgic wind and locally we observe even drifting snow. In 2 tackings, we pass Venina, the girl of the Czech group, and join her friend Pavel who just made it to the summit a little before us. 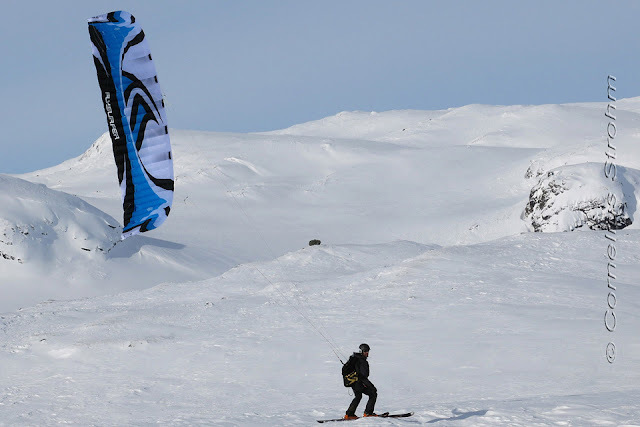 On arriving there, Ronny Finsaas, an experienced local kiter, appears out of thin air, racing up the glacier with his handle kite on 50 meters lines. Cornelius on the way towards the south Hardangerjökulen summit. We set sail towards the south dome of the icecap, a few kilometers away, to admire the view on the Hardangervidda plateaus. On our way back, we just manage to return to the main summit in fainting wind. For a moment we hesitate to head west-northwest, by crossing the slopes linking the top of the Middalen glacier to the domes of the Hardangerjökulen. We try and it seems to work, but without any guarantee in case the wind weakens. Finally, we give up and cross towards the northeast, 50 meters below the summit. There, as two days ago, only a a thin sheet of cold air creeps down the summit slopes. We make some effort to progress crosswinds, but with no better results than 2 days before. The lesson is learned, this time we give up. 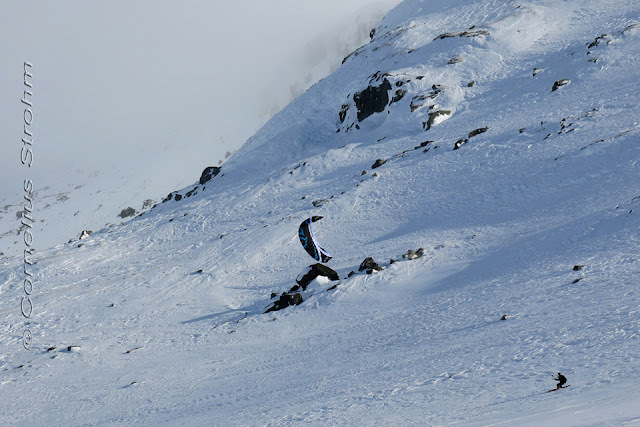 On Saturday, March 9th, the clouds are back, the visibility poor, and the easterly wind remains pretty weak. 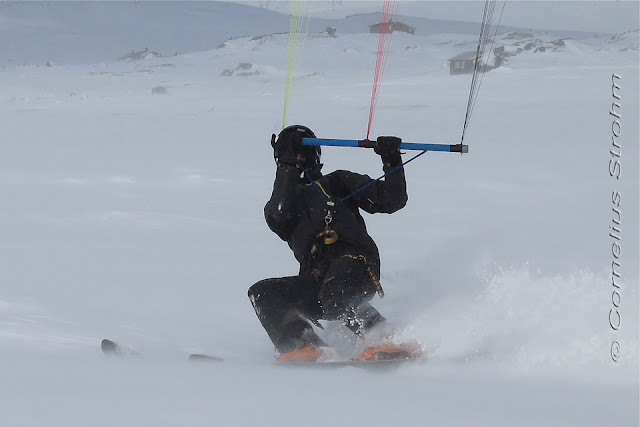 We take advantage to test the Speed 3 19 m2 with 46 m lines, instead of the 21 m supplied with the kite. 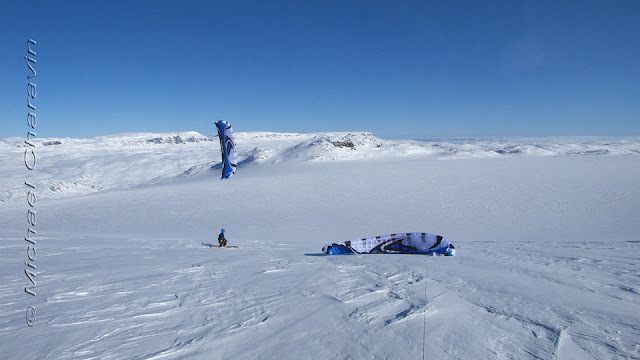 In 2008, during our south-north Greenland crossing, we had tested lines of 40, 50, 60 and even 100 Meters and quickly adopted the first 3 lengths systematically for our medium and large-sized kites. The interest had been immediately obvious. A larger wind-window allowing bigger, more powerful loops, the need to do less of them, while the kite stays higher above ground. In consequence, the risk of deflating the kite or tangling the bridles and lines in sastrugis is greatly reduced. 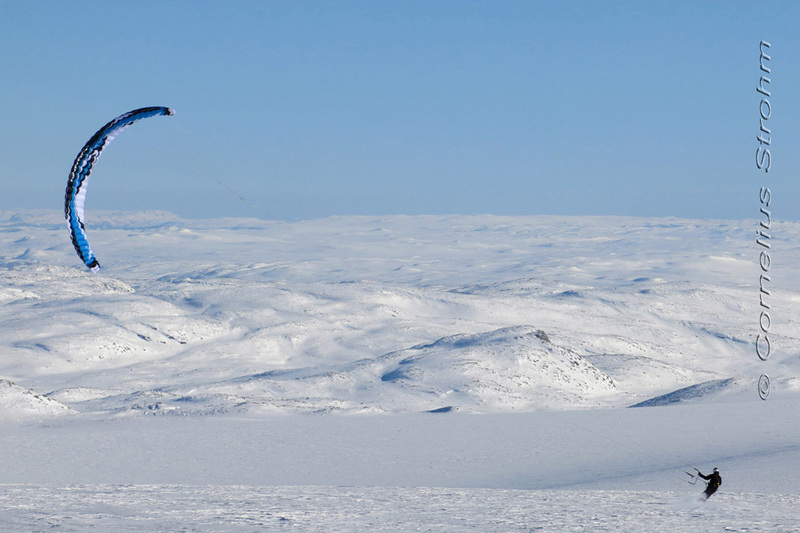 Fewer turns in the case of figure 8 patterns means also a reduced loss of proper speed of the kite, and allows one to catch stronger winds at 40, 50, even 80 m over the icecap where the wind speed is less influenced by the surface roughness, which is slowing down the flow of the catabatics close to the ground. Texts : Michael for WOG. Contact WOG2 on the Ice! Support us, donate to Wings over Greenland ! Unless stated otherwise, all content copyright Wings Over Greenland II. Simple theme. Powered by Blogger.